Domino effect is a fairly well-known mechanical effect in which a single falling domino (A tile of the tile-based game called Dominoes) causes a chain reaction. The resulting chain reaction depends on the size of arrangement – number of arranged dominoes. Usually hundred to hundred thousand equal sized dominoes are carefully arranged to form a sequence. Then, the first domino is flicked to start a huge chain reaction. There have been several world records with kinds of falling-domino-patterns based on this effect. But there is one thing about the domino effect that isn’t popularly known. When these falling domino records are made, they are usually done with equal sized dominoes. Suppose, continuously increasing sized dominoes are used in sequence, the size of falling dominoes can go really huge, pretty fast. The limit: When the size of second domino is from 1.5 to 2 times the size ( says a physics study) of the first domino, it can fall with ease. But that is the limit. If the second domino is any larger than 2 times the size of the previous domino, it won’t fall down – stopping the chain reaction in between. So, 1.5 times the size of the previous domino is a pretty safe increment to use, if you really want your chain reaction to complete. So, Morris in the video below, uses the first domino which is 5mm high and 1mm thick (I’m wondering how he manages to balance it on the 1mm side). The domino placed next to it is, 1.5 times thicker, longer and wider. So, if it is made of the same material, the second one would weigh more than 3.3 times the weight of the first one. Now do the math. He uses 13 dominoes with increasing sizes. The last one is about a meter tall and weighs about 50 kg. Remember, the first one probably weighed no more than a few grams. He flicks the 5 mm domino and within a second or two, due to the chain reaction, the largest one that weighs 50 kg, falls down with a huge bang. Had he used a few more dominoes and would have made the count to 29, the last one would have been as tall as the Empire State building. Imagine a domino of that size falling with such a measly initial energy expended to make the 5 mm sized domino fall. The amplification of energy is about 2 Billion times! Thanks to the stored Gravitational energy. What would happen if your stack was in a enclosed box? Is this force strong enough to flip a cargo vehicle? 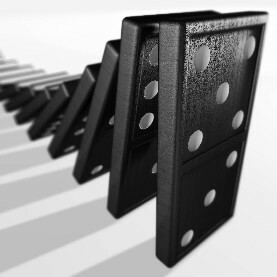 Is it a domino effect when one hits two and those two hit four and four hit eight and so on??? If not, how do you call it?